The music industry continues to evolve to meet changes in technology and consumer demand. Gone are the days when we'd simply pop into a record store and rifle through packed racks. In fact, 2017 saw only 17 percent of music purchased in physical form (for example, CDs and vinyl). A whopping 80 percent was downloaded or streamed. It's no surprise, then, that music sites continue to proliferate, and sorting through them all can be time-consuming. 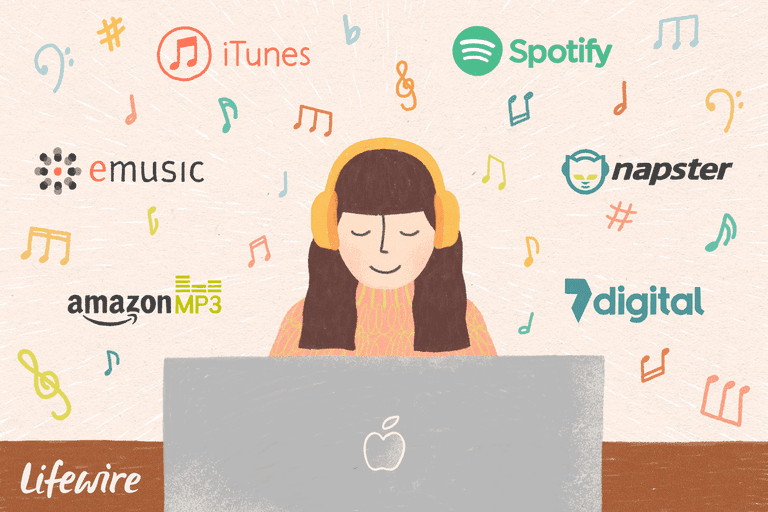 Here are six of the best music sites for downloading songs. Downloading music for free from disreputable sites (i.e., pirating) is not only illegal; it's unethical. As of 2018, musicians generally receive only 12 percent of revenue from online sales. Support the musicians who make the music you love by purchasing their art legally. Available on platforms outside of Apple devices. iCloud interface makes music available on all your devices. No access via the web. Many music fans regard Apple's iTunes store as the internet's premier music provider. Apple fans use iTunes' own software to access Apple's store, which naturally offers built-in support for syncing music to your iPod, iPhone, iPad, and other Apple devices. You don't have to have one to use this service, however. Apple's online store is more than just an online music service; other sub-stores offer music videos, audiobooks, movies, free podcasts, apps, and more. A social network (Connect) lets you follow your favorite artists and connect with others who appreciate them, too. Purchases are automatically stored in your own cloud-based music locker. Cloud Player makes streaming your music easy. Wide selection available for Unlimited subscribers. Integrates well with Amazon Echo devices. No weather, lifestyles, or sports content. Smaller catalog of songs than iTunes. Two music plans—Prime Music and Amazon Music Unlimited—with different catalogs can be confusing. Amazon Music has grown to be one of the largest stores for purchasing and downloading digital music. With many songs and albums retailing at a very competitive level in the digital music market, Amazon Music is certainly worth a look as an ​iTunes Store alternative. Fun and easy to create playlists. Can build and share playlists with others through social network. Can import your iTunes and Windows Music libraries. Advanced features require Spotify subscription. Can't sync playlists to more than three devices. Even though Spotify is essentially a streaming music service, its special Offline Mode qualifies it as a music download service, too. In this mode, you can download and listen to thousands of songs without needing to be connected to the internet. Browser-based listening on Windows PC and Mac. Search results can be used to generate downloadable playlists. Nothing to truly set it apart from other music services. Smaller music library than top competitors. Gone are Napster's days as a file-sharing service (which was shut down due to copyright violations). Today's Napster is both a subscription-based service and an a la carte music store. Selecting the subscription route gives you the opportunity to use Napster for music discovery: You can listen to as many songs as you like, providing you keep your subscription going. You also get MP3 credits by subscribing, which you can redeem for MP3 downloads. Free tier offers unlimited cloud storage and access to music collections, photos, audiobooks, and videos. Can use service on up to 10 devices at once. You won't find current major-label hits. Can download any single song only once. eMusic is a subscription-based service that provides a library of more than 32 million music titles, all from independent artists. The big plus about this subscription service is that all songs are DRM-free; you get a set amount (depending on your subscription level, the costs of which range from free to $29.99) to download and keep every month. Download up to 320 kbps high-quality MP3s. Digital locker comes free with account. Not all tracks are DRM-free. Smaller selection than that of other players. 7digital is a media service that provides not only music tracks, but also videos, audiobooks, soundtracks, and a selection of free MP3 downloads. The digital locker helps you to store all your purchased tracks safely in the event that you need to download them again.